As a scholar on the “critical” side of many debates in the study of religion, I have a general frustration with the impact of religious institutional footprints, affiliations and ethical assumptions on the American Academy of Religion. 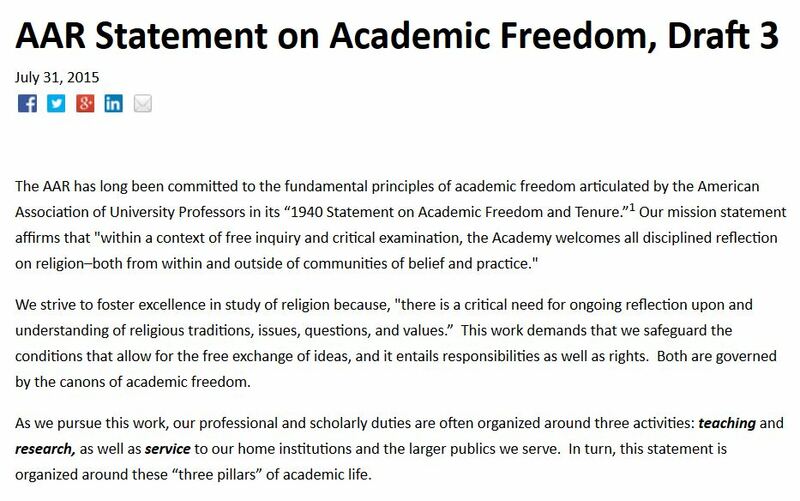 The language of “…within and outside of communities of belief and practice” and talk of “…religious traditions, issues, questions, and values” in the recent proposed revisions on the AAR Statement on Academic Freedom comes as no surprise. But what of ensuing political battles when our academic freedom is really put on the line—when our home institutions are forced to come to our defense, or when those institutions buckle to political pressure or threats from Trustees and/or big donors? I can’t help but wonder if concealed under some of the language found in the AAR’s revised statement, and maybe even obscured in the concern to draft a new document (at all), is an anxiety to insulate itself from having to come to bat for its members if ever they find their research, teaching, or public opinions on the hot seat. Veiled concerns over “compassion” under the “Research” section in statements like researchers must “exercise care” for the “well-being of students, colleagues, and members of the public” seems to be a kind of double-talk. Followed up swiftly by a celebration of “free inquiry” and freedom “to form conclusions,” you might think the statement is in our best interest as AAR members. But perhaps what is really offered in the new proposed statement is simply a concealing of litigious plausible deniability. That is, the statement offers far too much wiggle-room for ignoring or denying their responsibility to its members in moments when those members might need the organization’s support more than ever. The only statement of academic freedom worth its salt would be one that did not leave rhetorical room for the AAR to depose its way out of responsibility to its members. Too much of this statement echoes the trend in many academic institutions of out-sourcing liability “off-campus.” Frat parties can’t happen on-campus, politically contentious lectures can’t happen on-campus, professors can’t tweet on behalf of institutions, etc., etc., not for sake of liberal concerns about civility or responsibility but more of a neo-liberal shirking of responsibility. “We don’t really care what happens at all; just don’t get us involved.” If this statement is any indication, the AAR wants to get the most from its members, but doesn’t want to risk actually working for its members. If there is an alleged violation of academic freedom in research, teaching, or service AAR members are encouraged to carefully consider such claims and take appropriate action. The AAR does not adjudicate such cases, but its “Policy on Public Statements” indicates that the Board of Directors will consider requests to issue a statement on a case if the relevant procedures are followed, including by establishing that the request falls within the purview of the AAR’s concern to promote the study of religion and serve the professional interests of members. What good is a statement on academic freedom from the AAR if they are hesitant to take (at least partial) responsibility for “adjudicating such cases” unless “relevant procedures are followed”—procedures that currently remain disjointed? I get that the AAR is not a legal firm, but given this particular statement, I’m struggling to make sense of just what the AAR is beyond the organizer and promoter of our annual conference? I have spent a number of years in service to the AAR, far fewer than many of my colleagues, but enough to ask: Is this the best the AAR is willing to do in serving “the professional interests of its members” on such a significant topic as academic freedom?